We stayed at the Republica for two nights. The place is really nice, comfy beds, clean, with a bar and a nice patio to chill The best part of this hostel is really the people. Everyone was really helpful, and recommended where to go out/have drinks/eat and transportation. Would definitely go back there! Excellent hostel, digne d'un hôtel tellement c'est propre calme (animé quand il le faut aussi ! ). Situé dans un quartier hyper tranquille avec accès facile au centre historique. Un des meilleurs hostels que l'on ait fait en 5 mois de voyage ! Very very friendly staff. Extremely helpful. 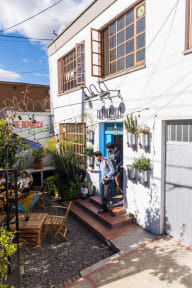 Hostel is a bit far from la candelaria but the buses that take you there ( and there are many) are just 2 minutes away. The shared space is lovely. Really good hostel with nice staff and decoration, but far from the historical center and the club area (and a bit complicated in bus during the rush hours). The lockers are not very safe (because they are built in wooden box) . The breakfast is really good but small . The lockers are not real ones. If I would have like, I could have taken the luggage stored next to mine. No space in the toilets / showers.